These intriguing photos are from a series of images that depict a ‘Pro-Rec’ mass demonstration held at Brockton Oval in Stanley Park in 1940. 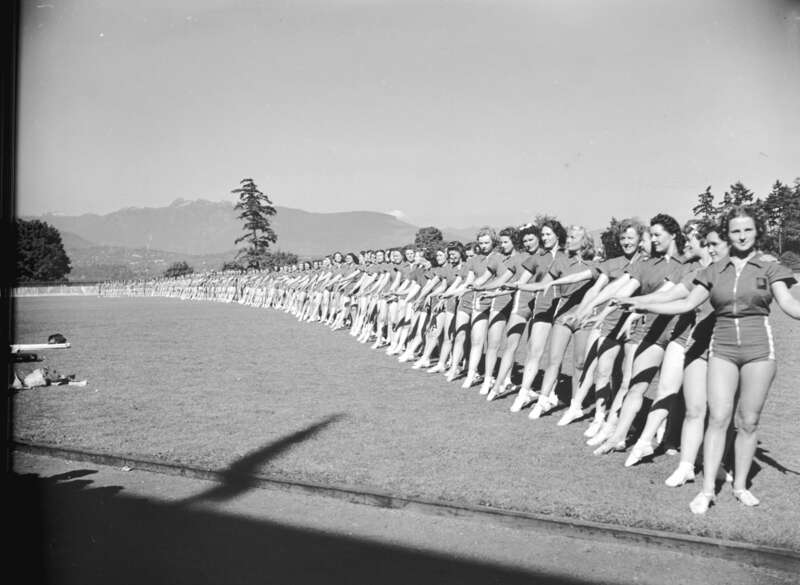 “Pro Rec”, short for Provincial Recreation, was a community sport and recreation initiative offered through the Physical Education Branch of the BC Department of Education. It was developed by Jan Eisenhardt (program administrator) with the support of BC Minister of Education, George Weir. The community-oriented scheme (initially set up in 1934) offered volunteer-run games and recreation classes for those unemployed aged 15 and over. The program proved so popular, that the Pro-Rec program was eventually made available to all in 1936. Summer displays (like these from 1940) were used to promote a changing schedule of activities. Men’s Pro-Rec demonstration in Stanley Park, 1940. 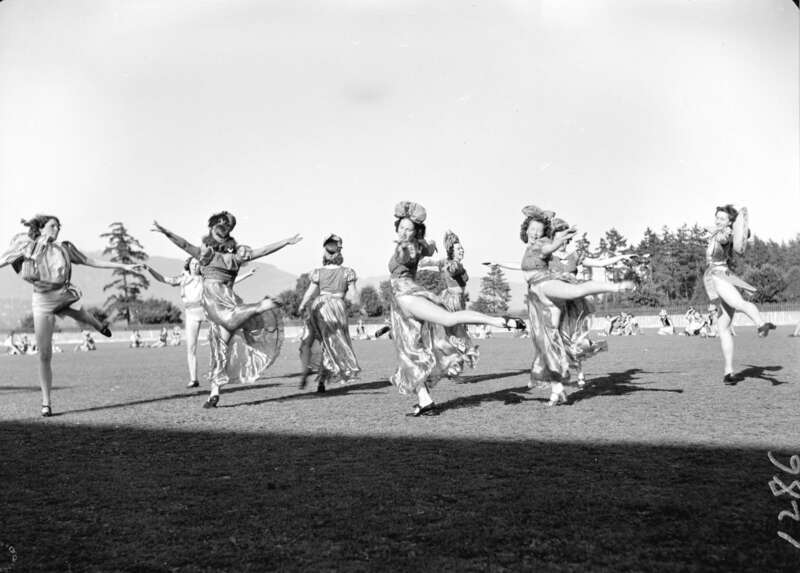 Photo: City of Vancouver Archives – CVA 586-228. It all started with the economic depression of the 1930s. BC (and Vancouver in particular) was especially hit hard by the Great Depression. Groups of men who had headed west in hopes of employment and a milder climate, found only desperation and poverty. City of Vancouver officials were burdened with providing what relief they could to thousands of unemployed people, while maintaining order in the midst of widespread hardship. Earlier solutions for unemployment, like the Unemployment Relief Camps (basically hard labour camps), were highly criticized and eventually discarded in favour of “more constructive and less punitive” solutions like the Pro-Rec program. Recreation and sport were seen as an antidote to economic woes. And so in November 1934, the publicly funded British Columbia Pro-Rec program was formed. The head of the Pro-Rec program, Jan Eisenhardt (1906-2004), was born in Denmark and came to Vancouver in 1928 at age 22. He worked for the Vancouver Parks Board, initially as a playground supervisor and was soon promoted to the Supervisor of Playgrounds. Eisenhardt brought to Canada a Scandinavian sensibility and a “dedicated commitment to physical health and activity as a means for securing social and personal freedom”. The Pro-Rec program he developed is noted for its innovative approach to both fitness and unemployment issues. The Pro-Rec program offered free classes and sports to its members including: exercise and fitness classes, bowling, basketball, volley ball, boxing, wrestling, gymnastics, and dancing. Pro-Rec also sponsored swimming galas, organized mass gymnastic displays, and social activities like hiking, picnics and youth hostelling. The BC Recreation and Physical Education Branch provided instructors for the various Pro-Rec activities, along with basic gymnastic apparatus and athletic equipment. In turn, local communities were expected to provide a facility that could serve as a recreation centre. In many communities, a church hall or a school auditorium served as the local Pro-Rec Centre. Pro-Rec participants came from “all walks of life” – unemployed youth, housewives, young working women and business men. I discovered that there was even a Pro-Rec marching song, it appeared on a leaflet for the 6th Annual “Pro-Rec” Mass Demonstration. We’re hale and hearty Pro-Rec’s, the pride of old B.C. Of all Canadian people, there’s none so fit as we. Until the nations echo, the Pro-Rec song we sing! The impressive demonstrations by young women’s Pro-Rec fitness classes staged at Stanley Park in the summer were highlights on the annual program of events (think Pep-Rally for Pro-Rec). These Pro-Rec displays combined exercise, health, fitness, grace and a splash of glamour which gave them a youthful, contemporary feel. They proved very attractive to a wide range of young women (and men I imagine) in the city. 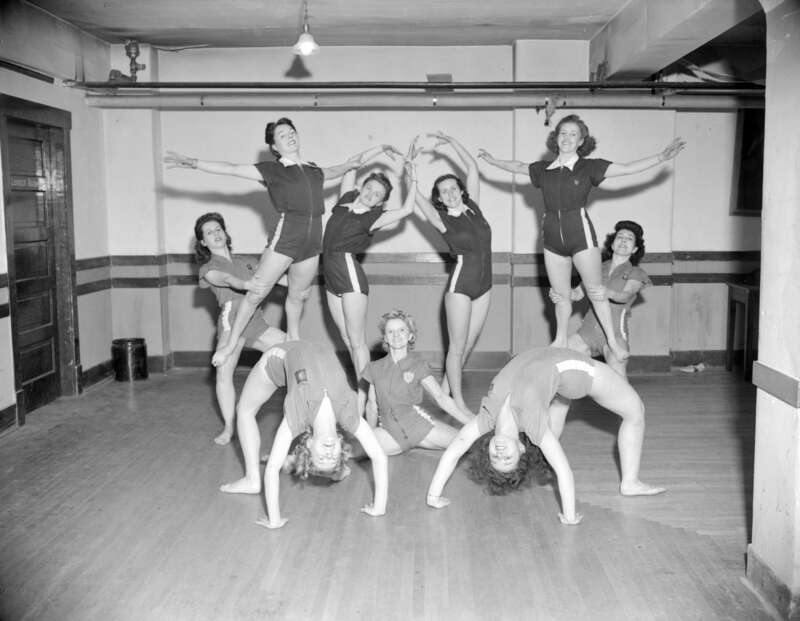 In fact, overall the Pro-Rec program attracted more women than men, very unusual for a physical recreation program. Clearly ahead of his time, Jan Eisenhardt supported the professional and personal advancement of female Pro-Rec leaders and members. 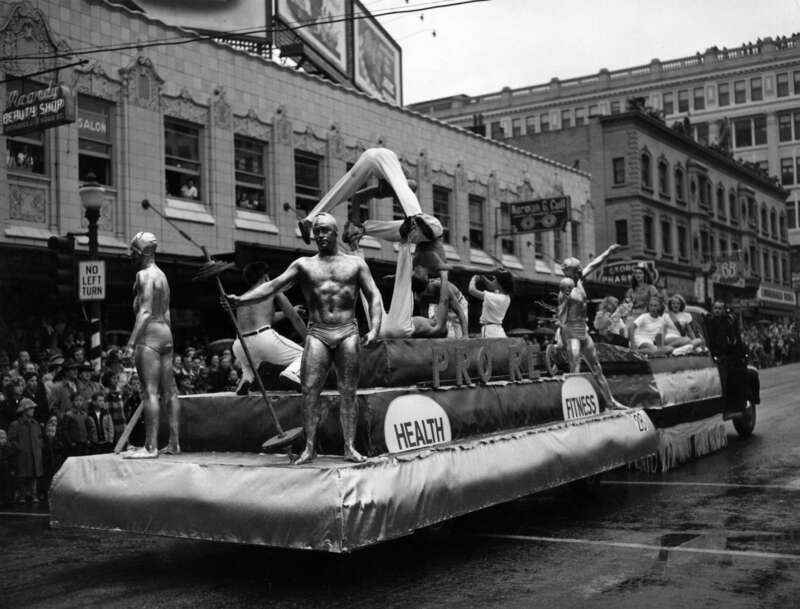 Pro-Rec float promoting fitness and health (though how healthy is it to be covered in silver paint?) in the 1950 PNE Parade. Photo: City of Vancouver Archives – CVA 180-1630. BC’s successful Pro-Rec program inspired other provinces to initiate their own recreation schemes, as well as influencing national recreation programs sponsored by the federal government. 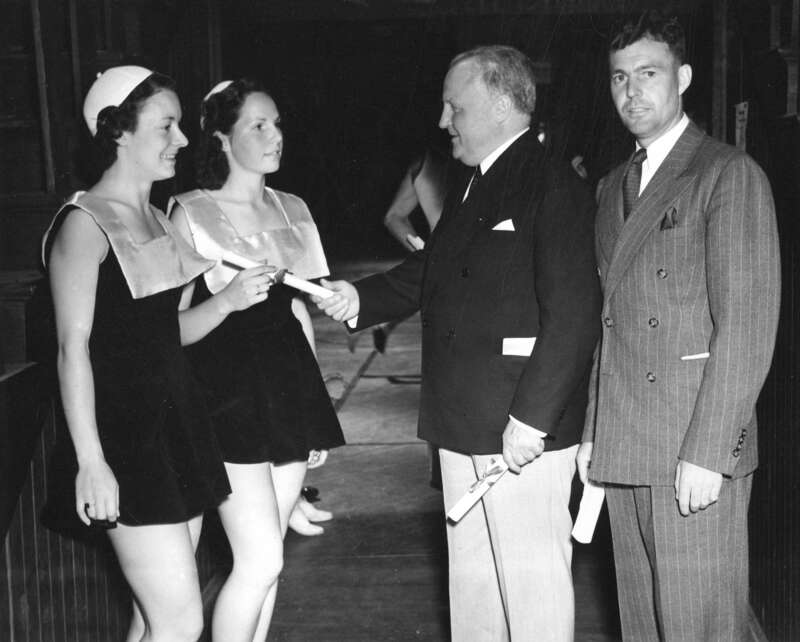 Jan Eisenhardt’s work in BC was so highly regarded that he was appointed the first National Director of Physical Fitness in 1943 after Canada passed the National Physical Fitness Act. Inconceivably Jan Eisenhardt’s career as the National Director of Physical Fitness came to an abrupt end in the early 1950s. In the midst of the Cold War he “was designated a security risk” and was (inexplicably) blacklisted as “Un-Canadian”. At the same time, “Fading idealism and Cold War skepticism” led to the 1943 national scheme being dropped 10 years after it began. 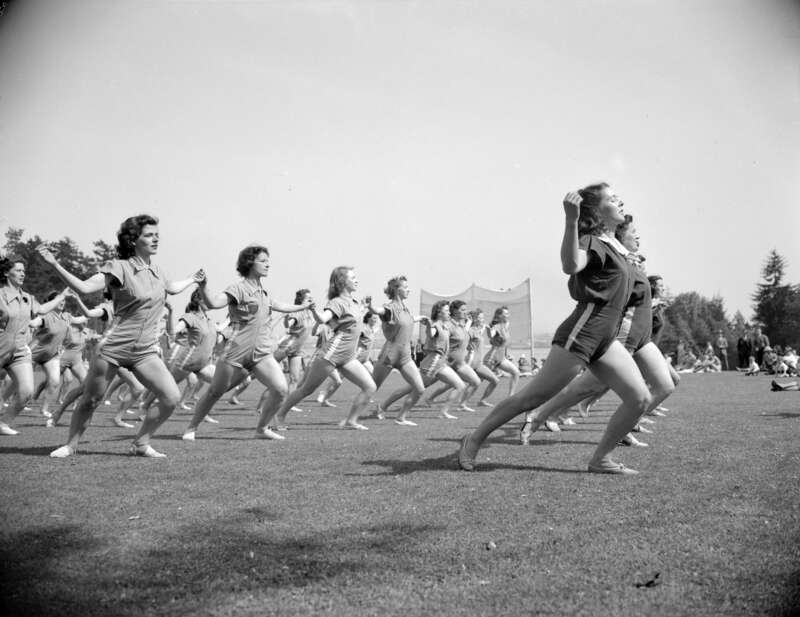 Canada’s National Physical Fitness Act was repealed in 1954. 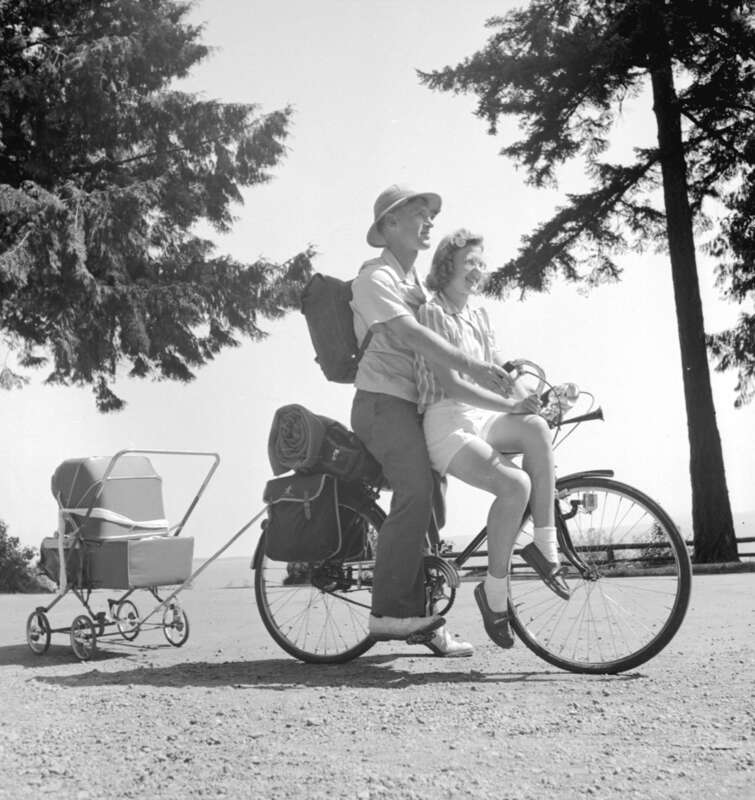 The Pro-Rec program in BC was dropped in 1953. Curiously this coincided with the advent of local broadcast TV, thus a generation of couch-potatoes were born. The story of Jan Eisenhardt’s blacklisting was told in the National Film Board of Canada film “The Un-Canadians” directed by Len Scher, 1996. ▶ “The UnCanadians” Jan Eisenhardt Segment 1 – YouTube. Check out this moving image footage (ca. 1939) from the COV Archives (click here) at the 11:45 min point there is about 1.5 minutes of Pro-rec material. 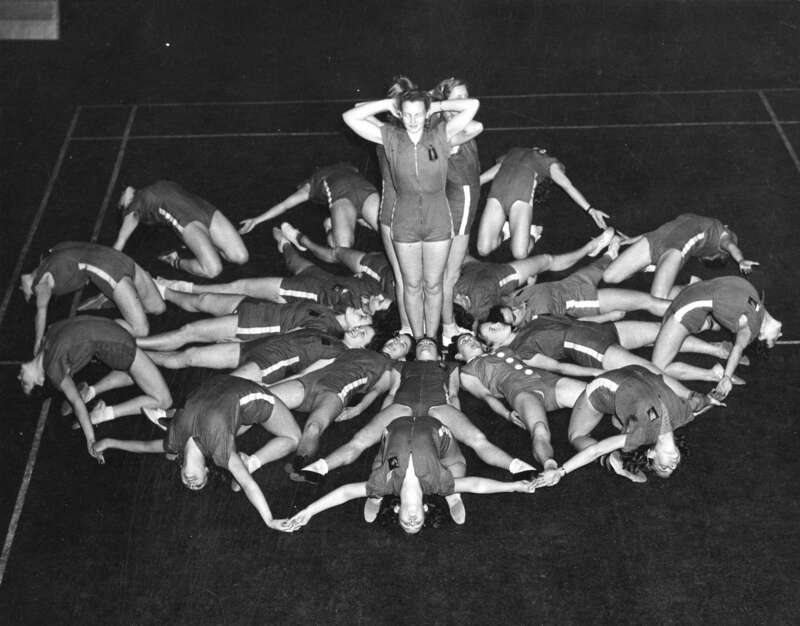 *Strong, Beautiful and Modern: National Fitness in Britain, New Zealand, Australia and Canada 1935-1960 by Charlotte MacDonald (Chapter. 5). 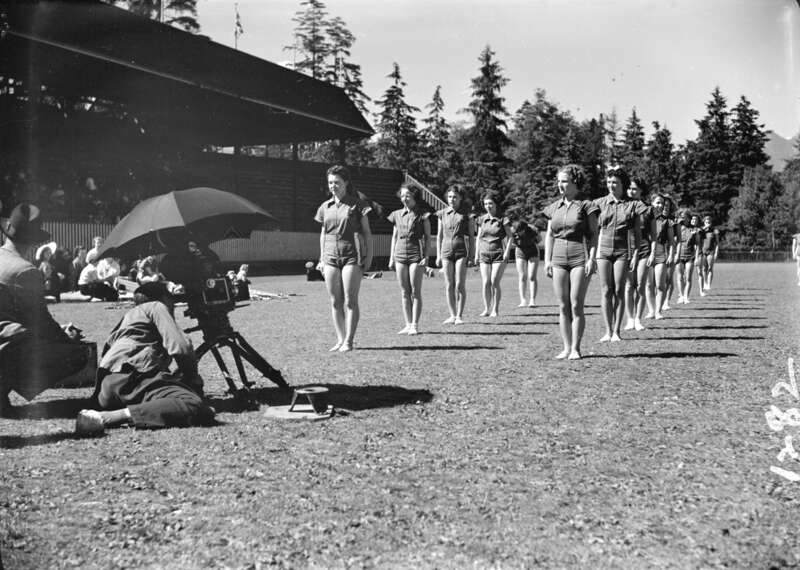 Fun fact: In addition to conducting community-based athletic programs, the Recreation and Physical Education Branch of the BC Department of Education published a monthly magazine (The Gymnast) and produced a series of radio broadcasts entitled “Gym of the Air”. You know there’s Moving Image of Pro-Rec, right? At CoV Archives! Have a look at at 11:45 there’s 1.5 minutes of Pro-Rec. It looks like Kits Secondary to me. Yes, I was aware of the film at the COV Archives. I will add the link… thanks for the reminder. I was also aware of the Pro-Rec material at the BC Archives…there is a whole series of material, including copies of the Por-Rec magazine “The Gymnast”. Perhaps a trip to Victoria is in order. There is also a 1942 NFB film, about 20 minutes long, entitled “ProRec in British Columbia.” I arranged a 2002 visit to Vancouver by Jan Eisenhardt when he was 96. The visit included a reunion with some ProRec leaders and, at Jan’s insistence, a kids fun run in Stanley Park. He was an incredible man. Thanks for the information about the NFB film, unfortunately, it is not part of their collection of digitized material available online. It would have been great to see. How cool that you were able to meet and work with Jan Eisenhardt! He certainly sounded like an incredible man, I’m glad that you confirmed that first hand. Re: “Pro-Rec in BC”. When I enquired with NFB about paying for digitalizing the film I was told that the original had been ‘misplaced.’ However, I was able to source a copy somewhere else and have it in my possession. You can certainly contact me directly if you are interested in seeing it. Thanks for the offer. Will do. Cool! thanks for the information…I’ll check that out. While reminiscing with friends in Calgary today, I spoke of Pro-Rec and sang the marching song that I’d sung some 65 years ago then chuckled to think that I could remember it. I decided to see what I could find on-line and here I am to tell you about my childhood experience. Pro-Rec was very big when I was a young girl living at 2158 East 46th Ave in Vancouver. I was a member as a pre-teen probably 1950-1952 when I attended evening classes at Tecumseh School on 41st Ave just west of Victoria Drive. The program was free, we had a mature female instructor I remember as being tall, slim, stern-looking but very engaging. In some ways it was a strict program, no fooling around but what I’d call structured fun. The teacher was wonderful (wish I could remember her name) she knew how to instill confidence in us which I felt was an important part of the program along with fitness, manners, good posture and poise. Growing up with brothers, I was thrilled to have my very own thing to do and can remember feeling like I belonged to some kind of amazing club. We did tumbling routines, pyramids, basic acrobatics, learned to march in formation & perform precision marching drills. We did a demonstration at a gigantic event that took place at the Forum or the Gardens (Hastings & Renfrew.) We also marched in the PNE parade perhaps it was 1950 the same year as the photo – City of Vancouver Archives – CVA 180-1630. Don’t recall the uniforms we wore but we were similarly-dressed, white & blue comes to mind possibly a kerchief around our necks for parading. For events, our instructor wore a white hat shaped like an air-force hat. After reading Pro-Rec’s history, it’s a shame it was abandoned. Thanks for the memories, a very joyful one for me. It’s easy – Once you see – How it is done. Wow, thank you so much for sharing your personal story with Pro-Rec – how interesting!. And thanks for sharing the tune and lyrics to the Pro-rec song! I find the whole program totally fascinating. I have a picture of a large group of Pro Rec participants, including my mother and father, who met at the program. I can provide you with a scan, or possibly the original if you like? I thought the photo was in 1929 but I could be wrong. Hi Barry, That’s so interesting that you have a photo of Pro Rec participants. If the photo features your parents you should keep the original, but thank you for the offer. It would be interesting to see a copy or scan of the image, though. Perhaps I could contact you directly, with your permission, and you could send it along. Unfortunately, WordPress does not allow people to send photos, via the comments function.